Note: I know I had promised thoughts on the passing of Michael Jackson today, but, and I say this with all due respect to the deceased, he’ll still be dead tomorrow. Today’s events are worth recounting today. We’ll talk about Michael Jackson tomorrow. I swear. 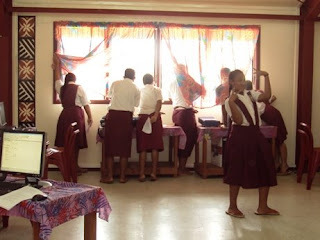 The Common Assessment Test, or CAT, is a computer practical that every year 12 computer student in Samoa takes on the same day. Administering the CAT is an incredibly difficult balancing act because the lady at the Ministry of Education, Sports, and Culture (MESC) takes it very seriously, but no one else does. We attended a series of meetings at the beginning of the school year emphasizing the importance of the CAT and the seriousness, solemnity, and dedication it requires on the part of the teacher. No one else at my school attends these meetings though, and the disconnect is astounding; comically so at times. Like today. The last few days have been stormy, but last night ups the ante. I sleep under a window, and the wind was strong enough that it blows rain at such a slant droplets fly past a metre of overhang, through my window, and on to my pitiful bed sheet. The storm lasts until moments before I leave my house to walk to school. This works out for me, but it means students have to travel through the storm to get to school, which means many students don’t come to school at all. I start to worry about what kind of showing I’ll have from the students. Another worry is an assembly has been scheduled for this afternoon. We had the Mother’s Day assembly during my last CAT, and it was a pretty big distraction. That said, the biggest worry of all is when/if MESC will deliver today’s CAT. In order to maintain the utmost security, the test is not delivered to the school until the morning of the day it is to be administered. My school was forgotten for the first CAT, and the second CAT arrived an hour late, so I have my doubts about today. I go to the secretary’s office before school and after first, second, and third periods. No CAT. I sit nervously through interval watching for cars thinking maybe one of them will bring my CAT. Finally I reach my breaking point. I go to the secretary’s office, and she dials MESC for me. The MESC Computer Studies lady is not happy to hear from me. She claims the CAT has been delivered, and asks for my secretary by name. My secretary, Faalau, gets on the phone and immediately begins to mumble in Samoan. The conversation goes on for a full 90 seconds before, without looking at me, Faalau opens the top drawer of her desk and pulls out the CAT, which had been delivered an hour before. I glare at Faalau who looks back at me with apologetic eyes. “No, this is not my normal arrival time,” I say. “I had an appointment in town this morning.” Faalau smiles, out of entertainment or relief that I caught her drift, I am not sure. “You had an appointment on the day of the CAT?” Asks MESC lady. I have blasphemed. I’m happy to be back in the driver’s seat early enough to administer the CAT before the assembly at 1:00. We only have enough computers for half the class to take the test at one time, and I get the first group started fine. A couple of them finish, and the rest are at least halfway through the test by the time I told the second group to show. It turns out that the assembly is starting 35 minutes early. I want to give the first group another 15 minutes, but that means telling the second group to sit in the back row of the assembly so I can pull them out quickly when it’s their turn to start. I begin to talk, but I stop mid-sentence when I hear it. The entire team shows up. They bring popsicles and noisemakers and visors and promotional T-shirts. The student body, which has already assembled in the hall just below my room, starts to shriek. Needless to say, my CAT is wrecked. I could force my kids to finish the test—over the clamor of hundreds of screaming students—but it seems cruel and pointless. A couple of kids from the second group show up after the assembly and one or two from the first group come back to finish their work. Other than that, the test is shot. The nice thing is whatever happens—if I re-administer the test Monday, or grade the tests with a slightly easier eye—no one’s going to put up much of a fuss, I think… except that lady from MESC, and I’ve already got her on the war path. The most annoying part is I didn’t get a visor. Lame. That’s all I got. I swear, MJ coverage tomorrow. 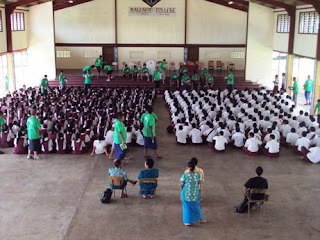 Toa Samoa pictures (and more!) below. 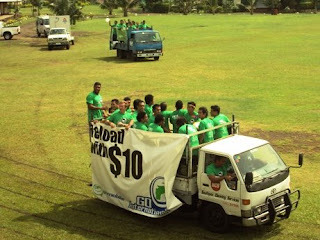 Pick-up full of rugby players with caravan in tow. My students go crazy at the window as students at the assembly begin to shriek. Amanda forgets the window to pose for the camera. 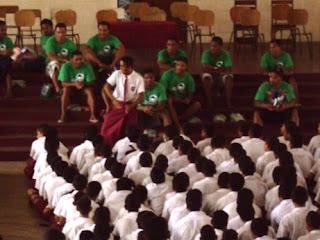 Toa Samoa in green distributing schwag. Luaao was the only one who stuck around and continued working on the CAT. I finally forced him out of the room. It just felt wrong having him stay up there. 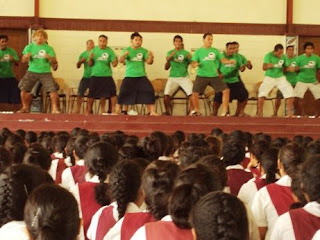 One of the boys dancing for the Toa Samoa. Toa Samoa doing their pre-game chant. hilarious! very very entertaining. miss you! aw it's like something out of a sitcom or something!